Pay-TV subscription prices are trending up as broadcaster competition keeps content rights costs high. Meantime, managed service providers are under pressure from OTT competition and must respond with a TV Everywhere proposition that is both functional and highly interactive with social media. The net result is ever more valuable content spread ever further into unmanaged environments and onto unmanaged devices. How are CA/DRM vendors responding to the challenges? 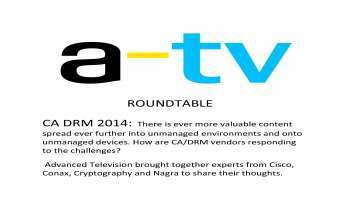 Advanced Television brought together experts from Cisco, Conax, Cryptography and Nagra to share their thoughts.